It’s been a slow start to 2017 for the Google Docs team, but they’re back into it with new updates for Google Docs and Google Sheets, there’s some Android specific updates and iOS users get some goodies as well. The drag and drop feature can be used in conjunction with the multi-window capability on Android Nougat, something I’ve been waiting on for some time. The image editing feature in Docs is a welcome change, allowing you to do a lot more with your documents while on the go. 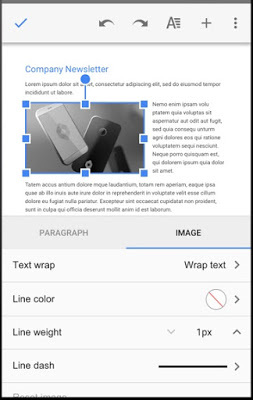 iOS users also get the ability to insert and edit headers and footers in Docs, as well as the option to insert page numbers in headers and footers and change a page’s size, orientation, and colour. They also pick up the option to insert and edit solid, dashed, and dotted borders in Google Sheets. The updates are rolling out quite quickly so you should be seeing an update notification in your Google Play updates panel shortly.